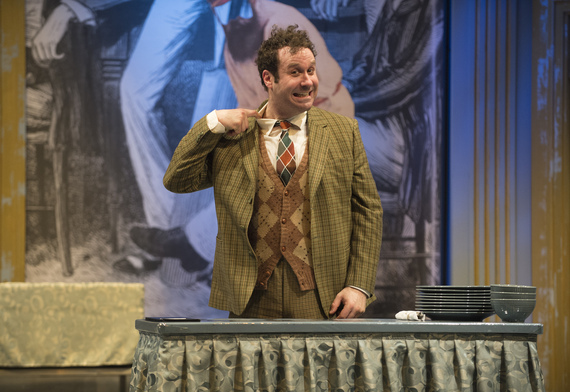 I've rarely seen a comedy as well written and and well produced as "One Man, Two Guvnors." I've rarely seen a comedy as well written and and well produced as "One Man, Two Guvnors." It is a rare gem with a script that can rival any farce and with fall-down physical comedy you'll long remember. Lead actor and tumbler Andrew McNee is so funny he made me think of Anthony LaPaglia (on "Frasier") and a little bit of Nathan Lane. This hilarious British play, written by Richard Bean, is based on "A Servant of Two Masters" (1746) by Carlo Goldoni. Bean's brilliant adaptation features so much visual and verbal comedy coming at you so fast you may miss a dozen laughs, but no matter. This play is full to the brim with clever writing and the Arts Club production is well directed by David Mackay. He must keep the action moving because speed is essential. Sometimes he must manage several story lines at once. Mackay has guided McNee in a superb performance. You won't soon forget a handful of other performers, either, including Andrew Cownden, Martin Happer, Gerry Mackay, and Andrew Wheeler. McNee is Francis, an unemployed and always-hungry musician who manages to find two employers for whom he works simultaneously as servant. It is vital that one "guvnor" not learn of the other, so Francis must keep them apart always. Comedy ensues. "It's alright, this two jobs lark, 'cause you can do what you like all day, and it don't matter if you get sacked 'cause you've still got the other job.. Why doesn't everyone live like this?" he asks the audience. As Francis keeps his two bosses apart, numerous close calls cause him to slip, fall, bump into things and tumble backwards onto his back. McNee is remarkable. His acrobatics are well-rehearsed and his poor body appears to take a great deal of punishment. In one ambitious sequence, Francis is overcome with confusion of playing two roles (the two different servants) at once. Francis and his alter ego do battle in a one-person tour de force. McNee slaps and pushes and grabs himself as he shifts his body to indicate which of the two servants is slapping which. Of course, a marvelous McNee is alone on stage for the whole fight sequence. We sympathize with him and hope he manages somehow to extricate himself from a situation that is always on the verge of exploding. McNee exudes tremendous charm and engages the crowd with his asides, some ad-libs, and invitations to audience members to join him onstage. On this night he asked the audience if anyone had a sandwich and one front-row audience member actually had one. McNee ad-libbed beautifully. "What kind of sandwich is it?" "Hummus? No wonder you haven't eaten it." Alfie (Cownden) sometimes steals the show as a very old pub waiter. His hair is completely gray and he walks very slowly. Think Tim Conway's old man character. Alfie gets smacked around frequently as he struggles to carry out his restaurant duties. When he's attacked by a swinging door, his response -- banging into walls and falling down -- seems to go on for a full minute. An unexpected feature is a four-member guitar band playing original skiffle-style music (by Grant Olding) to help establish the setting of 1963. The band at first seems to be the pre-show entertainment, but we soon discover the it will perform between scenes and its members have small roles in the play. The music not only helps to create a period setting, but the musical style reminds us of Beatles-era films that this play resembles. The period rock provides a joyful underscore for the show. The production of such a comedy is infrequent in Vancouver, given the size of the cast (14) and what must have been long rehearsal period to perfect the physical comedy. Have a look at Andrew McNee and you will recognize a star turn. "One Man, Two Guvnors," by Richard Bean, directed by David Mackay, at the Arts Club Stanley Industrial Alliance Stage in Vancouver until Feb. 22. Buy tickets here.